It's a dream come true: Your own brownstone pub next to Citizens Bank Park that is a true Phillies hangout where the locals talk lineups and stats. 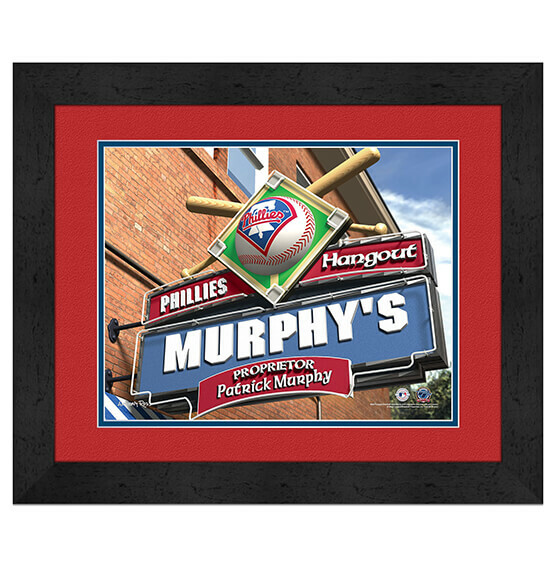 Our Philadelphia Phillies Personalized MLB Pub Sign Framed Print puts a fun spin on this dream! Just let us know what name or nickname you want printed on the marquee and we'll do the rest. Your custom Phillies sports decor will arrive ready to hang. With its vibrant team colors, official team logos and generously sized black frame, this personalized sign will make a fantastic addition to your home or office. Show your fan status of these two-time World Series champions with custom decor from PersonalizedThings by Exposures.